Parenting could be very difficult especially for first time parents. There's anxiety, fears, and excitement when raising your child. We mommies has a lot of question in regards with our child's behavior, ways of discipline, our child's emotional capabilities and supporting them. We are also worried or confused how to start our child's education. 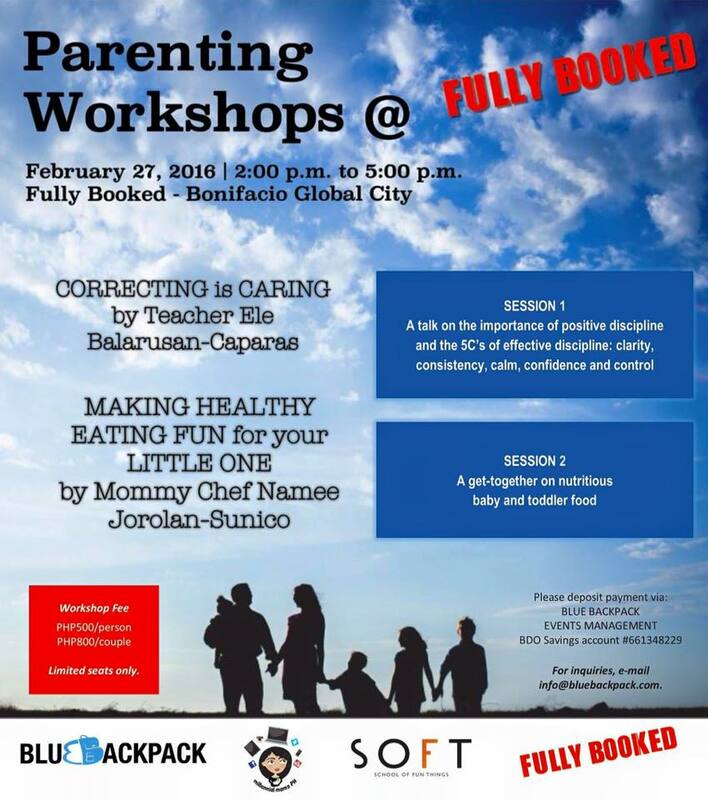 This February, there are workshops you can participate to prepare yourself or help you when it comes to parenting. Do you ever wonder if you're doing the right thing in raising your kids? How do you deal with the changes happening in their formative years? How do you understand their language? Do you give the right nutrition to your kids? This seminar is for all parents with children ages six months to five years old. Teacher Ele, the speaker will address the different changes of childhood years and how to deal with them with the proper attitude and discipline. Learn about the 5Cs of effective discipline. Mommy chef Namee will also give tips on what food you can offer to your kids that they will surely love! Enjoy a get-together and short demonstration on nutritious baby and toddler food. Happening on February 27, 2016 2:00 pm - 5:00 pm at Fully Booked, Bonifacio High Street, Bonifacio Global City, Taguig. Registration fee is P500 for individual and P800 for couple. Pinay Doulas Collective's would like to invite you to join their GENTLE BIRTH, GENTLE PARENTING" Workshop Series on 27 and 28 February 2016 (Saturday and Sunday) to be held at the National Council of Churches in the Philippines (NCCP) along EDSA (between PWU and Merced Bakeshop), Quezon City. - Learn about pregnancy nutrition, pre-natal exercises, optimal fetal positioning, breathing and pain management during labor, hospital and medical procedures, patients' rights, the role of fathers and doulas, birth and postpartum plans, breastfeeding and many more!- Participants must attend both sessions. - Learning Fee is P3,000 per couple, inclusive of snacks and all materials. - Connect with your baby by learning to read the kicks and wiggles in your tummy and learn about the importance of optimal fetal positioning as a key to successful natural childbirth. 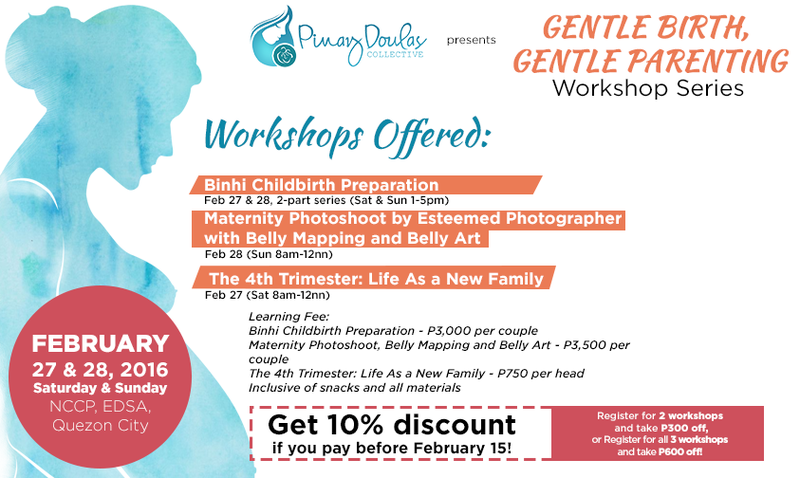 - Celebrate your pregnancy through a belly art and maternity photoshoot. - Learning Fee is P3,500 per couple, inclusive of snacks and all materials. - Learn about newborn care and development such as practical information for babies 0-12 months, newborn appearance, crying and sleeping patterns, infant feeding, playing, cloth diapering, babywearing and many more. - Also give focus to the new mother and father and learn about topics including mother's recovery from childbirth, emotional challenges of motherhood, putting parenthood into perspective and postpartum depression. - Pregnant women are welcome to join. You can also invite all the members of the family who will participate in the care of your baby. - Learning Fee is P750 per head, inclusive of snacks and materials. Get 10% discount if you pay before February 15 (Monday)! or register on all 3 courses and take P600 off! If you are interested, kindly register through this link. Choosing the right school for our child is one of the most important decisions we have to make. 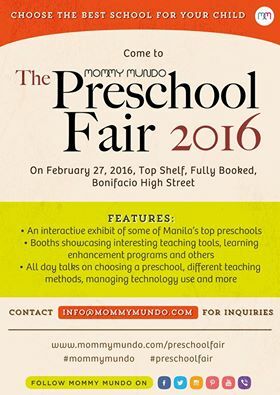 So Mommy Mundo are organizing the Preschool Fair 2016 where parents can check out interactive exhibits of some of the top preschools in Manila. School directors and teachers will be on hand to answer questions about teaching methods, class ratios, facilities and more. There will also be all day talks to learn from. There are booths showcasing interesting teaching tools, learning enhancement programs, and others. For more details of this fair, click this link. I hope I help you with this post. Thanks for dropping by! I hope I will have all the time in the world to attend such events. I'd never really tried attending one. It would be nice to attend these events but too bad I am far from the area. one of the things i love about fully booked is its accessibility to me haha! i love their lists of workshops too. we joined a reading workshop once with the kids. Attending seminars like these are helpful because one gets to see and hear others' perspective and proven ways. I just hope the place is convenient or near ours'. I'm glad Mommy Mundo has one of these, parents do need assistance when finding the perfect preschool. I wish I had attended parenting workshops when my son was still so much younger. Those would surely help me become a better first-time mom to him. But work got in the way. Sigh! Sayang naman may previous commitment ako on the 27th gusto ko sana dun sa preschool fair. But this is really nice. Wish I could join! Thanks for sharing, missing Pinas already.. Thanks for making a rundown of all parenting events this Feb. I'll share with other mom friends who have preschoolers. 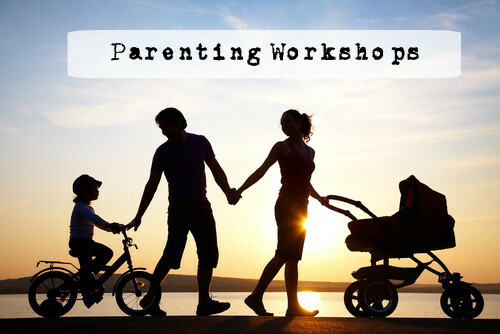 These events and workshops are great for new parents. You really learn so much from them. These workshops are very helpful. The pre-school workshop is interesting.